Ashgabat, Mar. 18(BNA): His Majesty King Hamad bin Isa Al Khalifa today held a session of talks with Turkmen President Gurbanguly Berdimuhamedow at the presidential palace in Ashgabat. President Berdimuhamedow delivered a speech welcoming HM the King’s visit to his country, announcing that Turkmenistan and Bahrain would celebrate 25 years of diplomatic relations. He commended political, trade and economic relations binding the two countries, stressing the importance of the visit that will further expand business cooperation. He also wished Bahrain further security and stability, led by HM the King. HM the King thanked Turkmen president for the invitation, stressing Bahrain’s strides in the sectors of culture, sciences, medicine, infrastructure and education. He extended an invitation to President Berdimuhamedow to make an official visit to Bahrain to further bolster bilateral relations and expand cooperation. The two leaders later held talks in the presence of delegations representing the two countries. Addressing the session, HM the King recalled the visit of President Berdimuhamedow in 2011 to Bahrain, stressing Bahrain’s keenness on following-up on the agreements and memoranda of understanding and strengthening relations. He stressed the importance of developing cooperation, underlining keenness on expanding trade, economic and investment ties and exploring oil and gas cooperation. He hailed the neutrality of Turkmenistan, which reflects its commitment to development, security and peace in the Central Asian region and the world. The two sides welcomed the establishment of a joint council. Key issues of mutual interest were also discussed. The two leaders then attended the signing of a string of joint agreements and memoranda of understanding. A Memorandum of Understanding between Central Bank of Bahrain (CBB) and the Central Bank of Turkmenistan was signed by CBB Governor Rashid Mohammed Al-Maraj and his Turkmen counterpart, Merdan Annadurdiyev. An agreement on the mutual exemption from visa requirements for holders of diplomatic, service and special passports was signed by Foreign Minister Shaikh Khalid bin Ahmed bin Mohammed Al-Khalifa and Turkmen Deputy Premier and Foreign Minister Rashid Meredov. A Memorandum of Understanding in the field of women’s affairs was signed by Foreign Minister Shaikh Khalid bin Ahmed bin Mohammed Al-Khalifa and Turkmen Deputy Premier and Foreign Minister Rashid Meredov. A Memorandum of understanding on cooperation in the sector of transportation was signed by Foreign Minister Shaikh Khalid bin Ahmed bin Mohammed Al-Khalifa and Turkmen Minister of Industry and Telecommunications Takhyrberdi Durkhanov. A Memoranda of Understanding on cooperation in the field of e-Government was signed by Foreign Minister Shaikh Khalid bin Ahmed bin Mohammed Al-Khalifa and Turkmen Minister of Industry and Telecommunications Takhyrberdi Durkhanov. A Memorandum of Understanding for cooperation in the sector of education was signed by Foreign Minister Shaikh Khalid bin Ahmed bin Mohammed Al-Khalifa and Turkmen Minister of Education. A Memorandum of Understanding on cultural cooperation was signed by Foreign Minister Shaikh Khalid bin Ahmed bin Mohammed Al-Khalifa and Turkmen Minister of Culture. A Memorandum of Understanding on youth cooperation was signed by Foreign Minister Shaikh Khalid bin Ahmed bin Mohammed Al-Khalifa and Turkmen Minister of Sport and Youth Policy. A Memorandum of Understanding on cooperation in the sector of tourism was signed by Minister of Industry, Commerce and Tourism Zayed bin Rashid Al Zayani and Turkmen Government Committee for Tourism. HM the King and the Turkmen president hailed the signing of the agreements and the memoranda of understanding that will herald a new phase in bilateral relations binding the two countries. 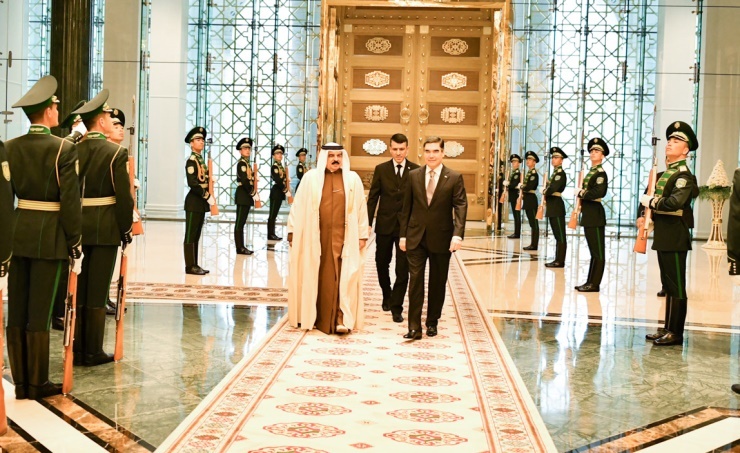 President Berdimuhamedow conferred the Bitarablyk (Neutrality) Order, the highest order in Turkmenistan, on HM King Hamad bin Isa Al-Khalifa, in recognition of his role in supporting relations binding the two brotherly countries. HM the King thanked the Turkmen president on bestowing on him the Order, symbolizing the importance of bilateral relations in all fields.